A collaborative event with archival selections by grunt gallery, VIVO Media Arts Centre and Western Front. Western Front’s contribution to this daytime screening will showcase unique moments in the history of the New Music program. The compilation of featured artists includes Don Buchla, Christopher Butterfield, Kazue Mizushima, Gordon Monahan and The Young Marble Giants. Other screenings at the event will include: Al Neil and Carole Itter’s Cabin by Krista Lomax, Rebecca Belmore’s Victorious, George Sawchuk: At Home in the Woods, along with selections of punk, poetry, and politics from the Lenore Herb Archive. An event to launch the Western Front’s newly digitized Literary Collection! The culmination of a year-long project, this event will feature a ‘reading from the archive’ selected by emerging poet Amy De’Ath. De’Ath will contextualize this look back on the influence of the Literary scene at the Western Front. with presentations by Dr. Gabriela Aceves Sepúlveda, Luke Fowler, and Althea Thauberger, moderated by Allison Collins, Dan Pon and Alex Muir. Archives at artist-run centres are a unique resource for artists and the community at large. Indispensable as sites for engagement with histories, they also offer space for creativity and new productions. “Artists in the Archive” will feature presentations by artists who are actively working with archives. Discussions will be aimed at linking the actions and strategies of artist-run centres, who have made significant strides to maintain their archive, with the ongoing work of artists who rely on the preservation of these vulnerable materials. Ongoing from Thursday November 26th to Saturday November 29th: Literary and New Music Selections will be on view @ the Western Front during regular gallery hours. Drop in to view the selections and join us for informal tours of the archive. 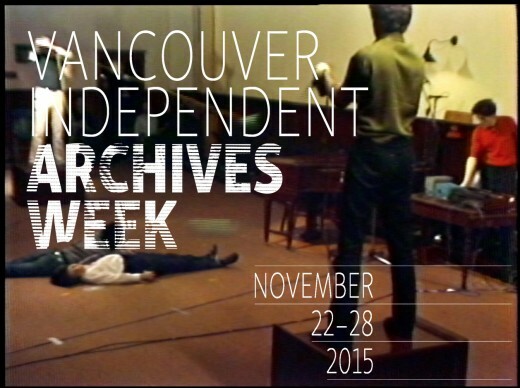 A full listing of activities presented from November 22 to 28, can be found at archivesweek.ca.